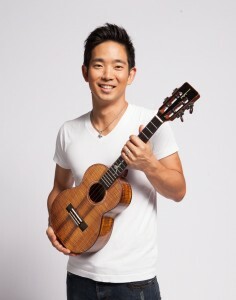 An aura of inherent boyishness infuses ukulele star Jake Shimabukuro: the gee-whiz adventurousness of an extreme skateboarder, game to go for the impossible, coupled with a disarming humility and genuineness that wonders at his skyrocketed popularity. The Hawaiian resident, Japanese-American by birth, shuns sophisticated framings of his virtuosity, insisting that the essence of music is the communication of feelings, and that the ukulele is essentially a child’s voice. Since the age of four he has regarded the seeming limitations of four strings and two octaves as an attractive challenge rather than a deterrent, just itching for defiance. Shimabukuro is a rebel, but a rebel with causes that reach beyond his own career, and even the immeasurable extension of the ukulele universe. His non-profit Four Strings Foundation is picking up where under-funded public music education is failing, providing ukuleles, materials and training to teachers nationwide. 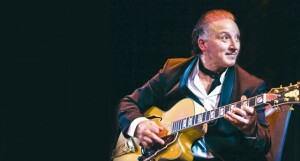 The master performer and string wizard, renowned for his jaw-dropping covers of “While My Guitar Gently Weeps” and “Bohemian Rhapsody,” returns to Campbell Hall by popular demand, after his hit Arts & Lectures show in 2011. Shimabukuro took a few minutes out of his crammed “Uke Nations” tour to field a few questions from the Independent. This entry was posted in Music and tagged Alan Parsons, Bohemian Rhapsody, education, Four Strings Foundation, Hawaii, Jake Shimabukuro, ukulele on October 21, 2014 by joemiller. This entry was posted in Music and tagged Academy of St Martin in the Fields, Alessio Bax, CAMA, Granada Theatre, Joshua Bell, UCSB Arts & Lectures on October 21, 2014 by joemiller. Violinist Daniel Hope, Mosher Guest Artist, in concert, presented by The Music Academy of the West. Saturday July 5, 2014, at Hahn Hall. English violinist Daniel Hope’s debut recital Saturday night was an exemplary Summer Festival guest performance: virtuosic in expression, fresh in programming, and winning in the guidance of an Academy ensemble. The unforgettable first half of this concert consisted of a variety of works for unaccompanied violin, all played with power, presence and astonishing control of sound, tone and tuning. The second half brought to the stage an ensemble of fifteen fellows and three faculty members for a performance of contemporary composer Max Richter’s “recomposition” of Vivaldi’s The Four Seasons violin concertos, a work premiered by Hope in 2012. The evening began with an unprogrammed segue to Passacaglia by Heinrich Ignaz Franz von Biber, composed by his late seventeenth century contemporary, Johann Paul von Westhoff. Imitation of Bells was a mesmerizing experience, a melody-less sequence of rhythmic arpeggios affected by the steady rocking of the bow over all strings. The resulting block of sound was at once static and dynamic, undulating on the surface while gradually transforming harmonically. Von Biber’s Passacaglia, which followed without pause, is another work at once simple and complex. A slow-walking descent of four repeated notes (think “Sing Christmas Bells”) forms the unvarying backbone of this solo violin showpiece, with all the interest invested in imaginative variation, ornamentation and filled-ins. Hope captured the improvisational character of Passacaglia, and proved that our favorite rock and jazz solos, inventions often built over just such simple vamps, are at root nothing new. The jaw-dropping event of the evening, however, followed next, with two modern masterpieces that combined broad tonal language with advanced techniques. Hope joked that Alfred Schnittke’s A Paganini pays homage to the legendary violinist and composer by running his Caprices through a blender. The Soviet and Russian composer, who made his living writing film scores, was fascinated by electronic effects, and Hope’s rendition was tastefully enhanced by the live manipulations of English sound artist Chris Ekers. Erwin Schulhoff’s Sonata for Solo Violin unfolds in four short movements, and evinces folk fiddle influences. Hope gave a touching introduction that honored the Czech composer whose life was cut tragically short during World War II. Max Richter allegedly wrote Recomposed: Vivaldi’s ‘The Four Seasons’ not merely in homage to the composer, but in revolt to nauseating habituation that employs the original as elevator and dental office music. The meta-dimension is extremely effective for awakening the listener: hooking the ear with familiar fragments of melody or orchestral ostinato, only to launch into the unknown (and frequently unresolved)—as if a familiar highway had been magically rerouted overnight. 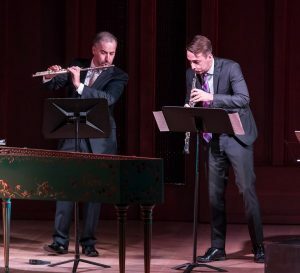 The fine ensemble was augmented with harpsichordist Chien-Lin Lu and harpist Ruriko Terada, as well as faculty members Jorja Fleezanis (violin), Alan Stepansky (cello) and Nico Abondolo (double bass). This entry was posted in Music and tagged Daniel Hope, Max Richter, Mosher Guest Artist, von Biber, Westhoff on July 10, 2014 by joemiller. 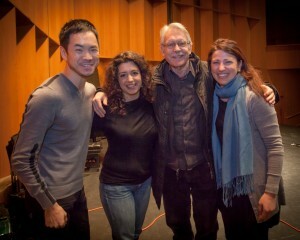 eighth blackbird presented by Music Academy of the West. Thursday, June 26 at Hahn Hall. Like the anticipation of a sunrise, the central focus of the Music Academy of the West is always just ahead of the horizon—that is, the professional musician of tomorrow. While ensuring continuity with the past, the faculty and administration also leave windows open to the present moment: opportunities for young Summer Festival fellows to hear and meet the pros who are only a decade or two down the road. 2013 MAW patrons will remember cellist Joshua Roman’s hip inauguration of new venues last year—curating at the Santa Barbara Museum of Art, and performing an unforgettable solo set in a Funk Zone photo loft. In through the open window this year flew eighth blackbird, the Chicago-based Grammy-winning contemporary classical sextet founded in 1996 that has made a name for itself playing new music. 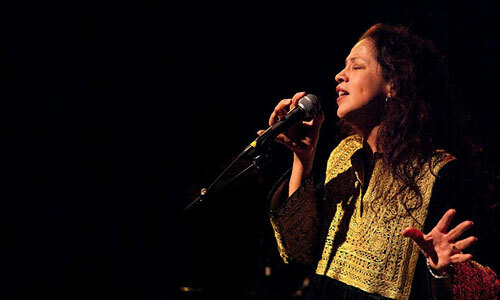 Indeed, the two sets performed at Hahn Hall, which displayed complex rhythmic finesse and theatrical flair, consisted entirely of new wine in new bottles, with no vintage older than 1982. New music is not everyone’s favorite cup—and as with wine, value becomes a function of age for many classicists—but the MAW does right by pointing to potential career routes outside of the symphony hall, and also by including imaginings from the front lines of musical invention. The most entertaining work of the evening was Counting Duets, a sequence of four Etudes by György Ligeti (arr. for ensemble by blackbird flutist Tim Munro and pianist Lisa Kaplan) that interlocked with four of Tom Johnson’s spoken word Counting Duets (1982). The Johnson pieces play out like a game, with two parts speaking entirely in numbers, contesting in dialogue, counting backwards and forwards, diverging and then coming together again in clockwork convergence. The Ligeti—notoriously beastly on keyboard—displayed new dimensions and marvels in these ensemble renditions. Duo for Heart and Breath by Richard Parry constituted the most intimate moment of the night, an experimental duet where pianist (Kaplan) monitored her heartbeat (via stethoscope) for tempo, while violist Yvonne Lam communed with her own breath (and I had the vivid sense that others in the room, like me, were suddenly made aware of their own vital signs). eighth blackbird (intentionally written in lower case) gets its name from a Wallace Stevens poem, the eighth verse speaking of “noble accents and lucid, inescapable rhythms.” More than anything, one comes away from a blackbird performance impressed with the rhythmic textures—the weave, the palette, the broad plateau of churning patterns. 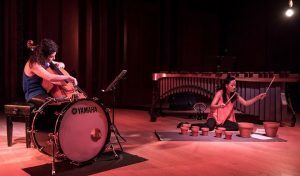 Matthew Duvall’s versatile percussion helps this along, with metal and rosewood marimbas, kick bass drum, snare, and much else. But at root the rhythm is in the writing, and every player, winds and strings included, helps the pulse along. This entry was posted in Music and tagged eighth blackbird, Music Academy of the West on July 9, 2014 by joemiller.